The Annual Dinner of the Etzion Foundation honoring the family of Dr. William Major z"l, father of alumni, Eugene Major '80 and Steven (Yanky) Major '86, Rav Moshe Taragin '83, Ram, Yeshivat Har Etzion and the Stella K. Abraham Beit Midrash for Women, and Alumnus of the Year Elie '83 and Miriam Berman, took place on Tuesday, March 13, 2007 at the Grand Hyatt Hotel in New York. David Landes, Chairman of the Board of the Etzion Foundation, remarked that this was the largest and most successful dinner ever. 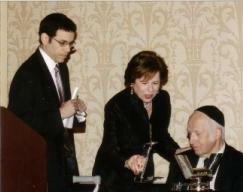 It was the first dinner that all the honorees were alumni of the Yeshiva or members of their families. He added that the remarkable dedication of the alumni is a reflection of the Roshei Yeshiva and Ramim and their selfless devotion to students, alumni and supporters of the Yeshiva. He thanked Mrs. Dorothy Berman, President of the Etzion Foundation, and Mrs. Shirley Schuster, Executive Director, for all their efforts in ensuring the success of the dinner, and to Rabbi Seth Grauer for all his efforts with the younger alumni and coordinating events with the Roshei Yeshiva. He also welcomed Yoel Weiss, Executive Vice President, who will lead the development efforts of the Yeshiva, and commended his professionalism and commitment. Harav Lichtenstein prefaced his remarks by addressing the challenges of functioning with infirmity, as a result of an injury earlier in the year (we wish Harav a refuah shleima!). He said that he has learned to appreciate more fully the words of Chazal that the most important thing is not the quantity of your study but that your heart should be directed towards heaven. 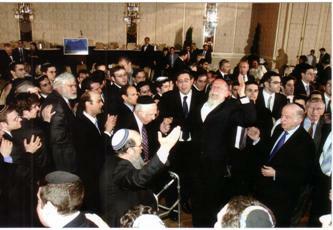 He added that he is most appreciative of the plethora of expressions of gemilut chasadim from which he has benefited. Rav Lichtenstein spoke about the fond memory which all talmidim have of Rav Amital's rendition of "VeTaher Libenu Le'Avdecha Be'emet", and of the need for the quest for truth in the totality of the human experience. "It is both a plea to the Kadosh Baruch Hu as well as a demand on ourselves," he said. "May we be challenged and inspired to see purity and integrity in our spiritual selves, together with joy and passion…enhanced by siyata de'shmaya, in molding our spiritual identity and commitment." Mrs. Esti Rosenberg, Head of the Stella K. Abraham Beit Midrash for Women, noted that almost ten years have passed since the establishment of the Women's Beit Midrash. "'Chaviva Ha'Torah al lomde'ha' guides the Beit Midrash," she stated, "as we give thanks for what we have accomplished and dream and pray for the future." There are today 130 students in the Women's Beit Midrash, including 30 from the U.S., Canada, England and Belgium, and more than 40 in the advanced teachers' training program. Three graduates are today numbered among the educational staff. Harav Gigi briefly presented several areas of activity in the Yeshiva today. He said that the vision of the Yeshiva includes responsibility to develop serious and authentic Judaism throughout the world. The Yeshiva views Torah study for women and the development of programs to ensure women's advancement in Torah study at the highest levels, and in the training of Torah leadership, through the Beit Midrash for Women. 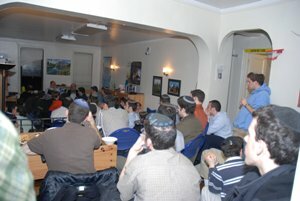 The Yeshiva sees as a lofty mission the transmitting of the study of Tanach, according to the unique methodology, which has earned worldwide acclaim, one of the central leaders of this method being Rosh Hayeshiva, Harav Medan. Another area of focus is the reorganization and more structured study of ToshBa – Oral Law, in order to enhance its study in the framework of Yeshiva high schools and restore it to its proper stature and place. Harav Gigi urged all alumni to visit the Yeshiva, especially during the coming 40th anniversary year celebration of the Yeshiva, to learn, even if only for a short time, and to again enjoy and breathe in the unique spirit found in the Yeshiva. Harav Amital was unable to attend the dinner this year (he is also recovering from a knee injury earlier in the year – refuah shleima!) but in a video message he said: "Each generation has a different message. The main message I would like to convey tonight is the need to strengthen the family unit. Before we left Egypt, we were enslaved to Pharoah. A person today whose sole focus is his business and career, and who doesn't concern himself with his family, and for whom family is not a top priority, has not yet left Egypt; he is not yet a free person, he is still enslaved to the modern Pharoah. The connection with children and family is very important – that is the most important message today!" Elie Berman, '83, Alumnus of the Year, said that he accepted the honor because he wanted to publicly thank the Yeshiva for what it gave him and continues to give him. He said that he went to the Gush because he wanted to learn how to learn and he gained that, while also learning how to live. "I learned from Harav Lichtenstein that when approaching a sugya or important existential issue, there are few simple answers; invariably, one must struggle," he said. "In Rav Lichtenstein's shiur, I came to appreciate the profound depth and breadth of his Torah knowledge and realized that his genuine piety, humility, righteousness and entire personality is even more beyond comparison than his learning. 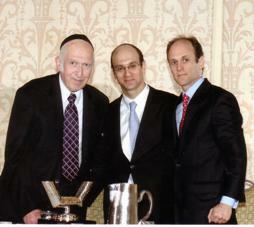 I am forever grateful to the Yeshiva and especially to Harav Lichtenstein." Elie added a challenge to alumni, "to make sure to both appreciate and utilize what we received and to use that to further ourselves, our families, our communities, and Klal Yisrael." On a personal note, despite the strenuous objections of his mother, Mrs. Dorothy Berman, Elie declared, "I stand before you tonight as a proud son of a woman who over the last two decades has given more of herself than anyone else to this Yeshiva. Thanks Mom." Rosh Hayeshiva Rav Yaakov Medan, speaking in Hebrew, addressed the process of the introduction of new spiritual leadership in the Yeshiva, which, thanks to the example and tradition of Rav Amital and Rav Lichtenstein, has transpired with ahava, shalom and re'ut, he said. For him, coming to NY and seeing so many of alumni who are lawyers and businessmen, immersed in Torah on a high level, with Yirat Shamayim, and providing a strong Torah education for their children, "gives me much strength and spiritual support." 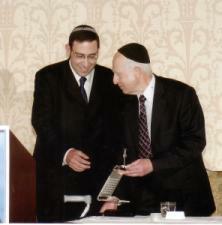 "In these difficult times in Israel, and for the religious Zionist community in particular," Harav Medan said. "we believe that the Torah and only the Torah is the Amud Barzel (iron pillar) on which we can lean – that is our secret." Yom Iyun: A special morning of shiurim and presentations took place on Sunday, March 11 at the Fifth Avenue Synagogue in NYC, delivered by Rosh Hayeshiva Rav Baruch Gigi, Rosh Hayeshiva Rav Yaakov Medan, Rav Moshe Taragin, and Mrs. Esti Rosenberg, Head of the Stella K. Abraham Beit Midrash for Women. Thank you to the Yom Iyun Coordinators – Rivi and Avi Katz '76, Sally Mendelson and David Lowenfeld, and Yocheved and Nathan Lindenbaum '78. An alumni get-together took place with Rav Medan and Rav Gigi on Monday, March 12 at the apartment of Aaron Horn '03 near YU. 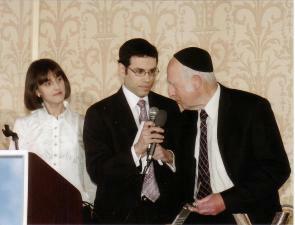 Both Rav Medan and Rav Gigi gave short divrei Torah, followed by a question and answer session. The questions ranged from the difficulties of making aliya to authorship of Nevi'im Achronim to the modernization of Halacha. Close to 75 alumni attended this event. It was a positive experience for alumni to gain a feeling of connection to the next generation of Roshei Yeshiva. 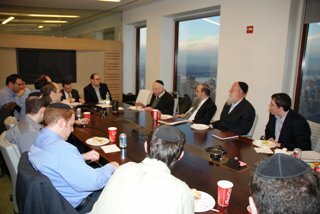 Roshei Yeshiva meet with alumni in the Manhattan office of alumnus Meir Nordlicht '86.